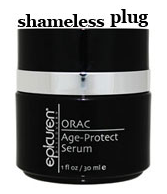 The New York Social Diary has a No Holds Barred feature that sings the praises of Epicuren Discovery and the ORAC Age-Protect Serum. Blair Sabol loves the smell and the feel on the skin of the ORAC. She's experienced real results.